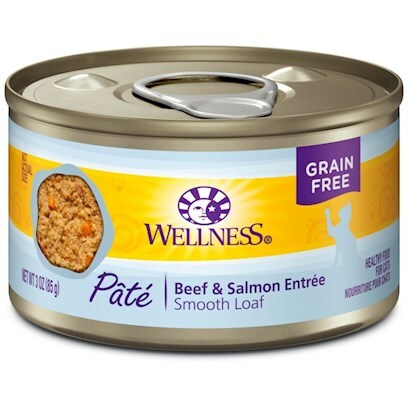 Wellness's beef and salmon recipe provides two sources of protein to your cat, with a taste that she'll savor. They use high quality beef that's free of added growth hormones and steroids. And Omega fatty acids from the salmon will keep her coat shining naturally. Other whole ingredients provide a balanced diet for your cat. Each can is packed with fruit and veggies for optimum vitamin and antioxidant content. Whole cranberries and blueberries are included to promote urinary tract health. And taurine, an essential amino acid for felines, is added for normal eye and heart function. You won't find unnecessary sugars, fillers, artificial preservatives, and meat by-products crowding the ingredients label - just natural food and vitamins for a healthy, happy cat. For adult cats, feed two cans per 6-8 pounds of body weight per day. Feed at room temperature and refrigerate unused portion.